The guy behind Super Hexagon and VVVVVV thanks Dong Nguyen for the inspiration. Indie game designer Terry Cavanagh certainly has a unique flavor. He's known for making ridiculously difficult games that are still somehow impossible to put down, like Super Hexagon and VVVVVV. With games like that in his blood, it only makes sense that Cavanagh would celebrate the brief life of Flappy Bird with his own tribute called Maverick Bird: A Flappy Bird Fan Game. The flash game is pretty similar to Flappy Bird, but painted in layered pixel art and saturated in thumping base (and that shade of pink is TOTALLY ripped from that one NES game, I'm sure). 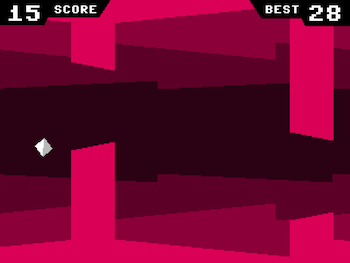 The gameplay's a bit tweaked, as you also have a "dive" button to quickly jump through an opening. Don't think that makes things any easier, though, as this is still classic Cavanagh. One corner of the screen tracks your current score, while the other reminds you of your best run, taunting your failures like a disapproving father. "Thanks for the inspiration, Dong," he writes. "Looking forward to your next game when things settle down!" Flappy Bird has certainly had an interesting ride so far. Its creator, Dong Nguyen, yanked it at the height of its viral popularity. He claims it's because the game was simply too addictive, but it seems that he was more uncomfortable with the sudden fame than anything. While the first fad of 2014 has now vanished into the electronic aether, Nguyen still maintains that he'll return at some point.